Ahead of Earth Day on Sunday, Apple today announced a few initiatives that support the company's commitment to the environment, including its goal of making its products using only recycled or renewable materials. First, for every device traded in or recycled at Apple Stores or on Apple.com worldwide between today and April 30, the company will make a donation of an undisclosed amount to the non-profit environmental organization Conservation International, which has worked to protect the nature in more than 30 countries. Apple has streamlined its trade-in and recycling options into a new GiveBack program, available on its website and at its participating retail stores. 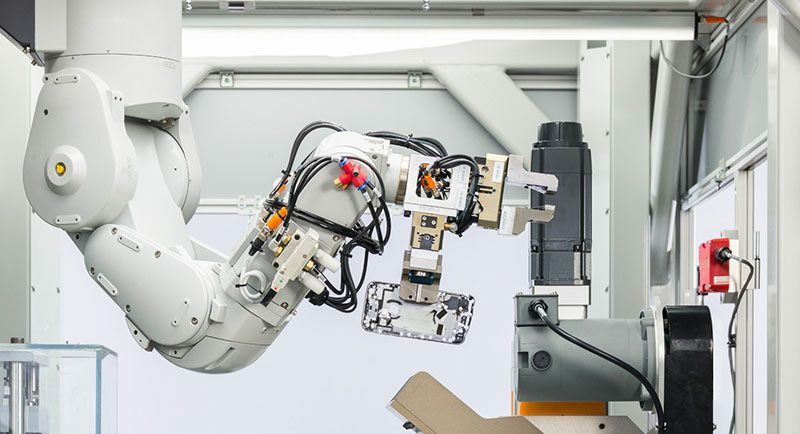 Second, Apple introduced a new iPhone disassembly robot named Daisy as an improved version of Liam, its first disassembly robot launched in 2016. Daisy is located in Austin, Texas, with a second robot coming to Breda, Netherlands. Daisy is made from some of Liam's parts and is capable of disassembling nine versions of iPhone and sorting their high-quality components for recycling. Daisy can take apart up to 200 iPhone devices per hour, removing and sorting components, so that Apple can recover materials that traditional recyclers can't — and at a higher quality. At Apple, we're constantly working toward smart solutions to address climate change and conserve our planet's precious resources. In recognition of Earth Day, we are making it as simple as possible for our customers to recycle devices and do something good for the planet through Apple GiveBack. We're also thrilled to introduce Daisy to the world, as she represents what's possible when innovation and conservation meet. Apple has also released its 2018 Environment Report today, detailing the company's environmental progress in three priority areas: reducing its carbon footprint by using renewable energy sources, conserving precious resources, and pioneering the use of safer materials in its products and processes. Last week, Apple announced its global facilities are now powered with 100 percent clean energy, including its retail stores, offices, data centers and co-located facilities across the United States and 42 other countries. Last, Apple Watch owners today will receive a notification about an Earth Day activity challenge, as we revealed earlier this week. To earn the badge, users will have to complete any workout for 30 minutes or longer on April 22. If there are only two robots, in Texas and the Netherlands, wouldn't the enormous footprint of shipping hundreds of millions of iPhones from all around the world to these two locations; negate any environmental benefits of recycling the phones in the first place? Optics are everything. Facts are so last century. Apple: "In recognition of Earth Day, we are making it as simple as possible for our customers to recycle devices" . . .
How about as simple as possible to repair devices? I bet Daisy sheds a tear every time she pulls out an old headphone jack. It is a real shame when Apple designs commodity products that are so short lived they have to develop robots to take them apart before they go into the landfill. The sad thing is that most people just toss their phone in the waste bin. So, while this looks great, 200/hr times two locations is nothing but lip stick on pig considering the number of abandoned iPhones. Now that no one needs a new iPhone every year how about making the battery replaceable so an iPhone can last 5 or 10 years. After all a phone is a phone and we did not start throwing away phones every year until the iPhone was released. Up till then, my land line phone was so old I can't remember when I got it. While Apple's iPhones are great devices, that fact that they are designed to be thrown away really tears down Apple's image as a green company. The reality is that Apple's design decisions are about cost, not green, but man they spend so much money that their followers (sheep) really can't see the forest for the trees. Who is throwing away their iPhones? I keep mine on the two year cycle and either sell or turn in my phone to the carrier or apple to get a discount on the new one. I never have trouble selling a two-year-old phone. Before smart phones I was much more likely to throw away an old cellphone because it was borderline useless and there wasn't nearly as many ridiculously easy ways to sell or recycle them. You never threw away your landline phone because it never gained any new features or functionality. Also, the batteries are replaceable for $29 on iPhone 6/SE and later. If it's older it's $79, which is about the going rate of a good replacement battery for pre-smartphone cellphone around the late 1900s early 2000s. If you don't care about new features or functionality you can keep your iPhone for 5-10 years. No one is stopping you. They aren't at all designed to be short lived. Sure, eventually the newer iOS may slow it down a little and the battery life will diminish but you can stop upgrading the iOS and as I sad before YOU CAN REPLACE THE BATTERY. Also this isn't an iPhone thing. There are way more android phones floating around in the world than iPhones so rethink your "sheep" statement when it comes to e-waste. Poor attempt to spin this program negatively. Given Apples environmental concerns and values, at least it shows productivity in an area where we don’t know how other electronic manufacturers recycle their devices given the opportunity. Even if it is 200 phones an hour, that is still 200 phones that are not necessarily being improperly disposed of. 35 million recycled phones a year is nothing? Hmmmmm okay.